I have a dream for the Milwaukee Bucks. It involves Giannis growing into his body and then eating swingmen alive on defense. It involves Jabari growing into the new Carmelo but with better passing and a lifetime at stretch 4. It involves Larry Sanders turning into LARRY SANDERS! again down low, and Jason Kidd leading a Bucks revolution that has the whole world fearing the deer again. Then … WHOA. What? I hadn’t even considered that. It makes so much sense for everyone involved. This changed my whole world. Before, getting way too excited about Jabari and Giannis and the Bucks revolution was a stupid distraction while I waited for basketball to come back. Now? I’m pretty sure the Bucks are one Bledsoe sign-and-trade away from turning into one of the best young teams in the league. So let’s talk about this. There are a couple of different angles to consider here. It’s tough to parse exactly what’s happening with the staring contest between Phoenix and Rich Paul over Bledsoe’s deal this summer, but it’s pretty clear that whatever power play someone is trying to pull here is not working. Bledsoe’s a great player, and could still get better, but he plays at the deepest position in the league. Even his own team has two other guards who can be just as effective as he is (Goran Dragic, Isaiah Thomas). I’m sure Bledsoe wants to go to a big market, but if he wants to make max salary, he needs a team with talent elsewhere, cap space to burn, and a hole at point guard. There just aren’t many options out there. The Lakers might have made sense, but they seem to be biding their time until 2016 when Kobe retires. The Knicks are waiting for Rajon Rondo next summer. The Heat don’t have room for Bledsoe, and if the Rockets were going to make a play for him with a sign-and-trade, it would have happened by now. This leaves the Bucks, a team with new owners, in a much easier conference, with a new coach (Kidd), the likely rookie of the year (Jabari), the most intriguing young player in basketball (GIANNIS), and a young big man who’s due to bounce back after a year from hell (Sanders). Even if Bledsoe’s not wowed by the small-town charms of Milwaukee, it’s hard to imagine a situation with more upside. And again, it’s hard to find many other teams that would pay him a max salary. Because keeping Bledsoe doesn’t make sense if he wants a max deal. The Suns were really fun last year, but they still weren’t good enough to make a dent in the West. Even if Bledsoe gets better over the next few years, that doesn’t make them that much better. The Suns still have to pay Dragic, and they’re biding their time and collecting assets to make a play at a superstar. Paying big money to keep Bledsoe makes both those jobs harder. Phoenix already got Thomas this summer as insurance if they lose Bledsoe — he came on a super-cheap deal, kind of the NBA version of the Eagles getting Darren Sproles — so it’s not like this would drastically change the team the Suns already have. It would just mean staying flexible enough to have a shot at getting better down the line. Would they have offered a max deal assuming they had the cap room? I’m not so sure, nor do I know if Bledsoe would have taken it then (because we’re the Bucks and basketball players tend to be winter-hating jerks) or now (probably much more likely, eh?). Back in July they could have cleared money for a max deal by eating some salary (i.e. stretching the now-traded Carlos Delfino) and/or bribing someone to eat another contract, but they were probably also a bit hesitant to go through the hassle for a guy whose offer sheet seemed likely to be matched. But in hindsight? Who knows, that hassle might have landed the Bucks a high-upside, high-risk guard to throw into the mix with Jabari and Giannis [swoons]. Three months later, it still makes sense for the Bucks for a couple of reasons. There’s talent everywhere — Giannis, Jabari, Sanders, John Henson, Ersan Ilyasova. They still need a shooting guard beyond O.J. Mayo, but finding solid role players at that position isn’t that hard. Look at what Arron Afflalo went to the Nuggets for. If this team gets serious over the next year or two, they’ll find someone. The problem is point guard. Brandon Knight is apparently a good guy and a hard worker, but he’s not good enough to start for a playoff team. Zach Lowe explained this in depth on Tuesday. If the Bucks are going to be a postseason team every year, Knight’s not the guy. In that case, how many other times do you have an opportunity to sign a 24-year-old who has a shot at becoming a superstar? This is a rare case where it really doesn’t make sense for that star’s team to keep him, but it’s not a reflection on anything Bledsoe can’t do. Short of bottoming out again this year, and landing a point guard in next year’s draft, this is the easiest way for the Bucks to solve their biggest problem. 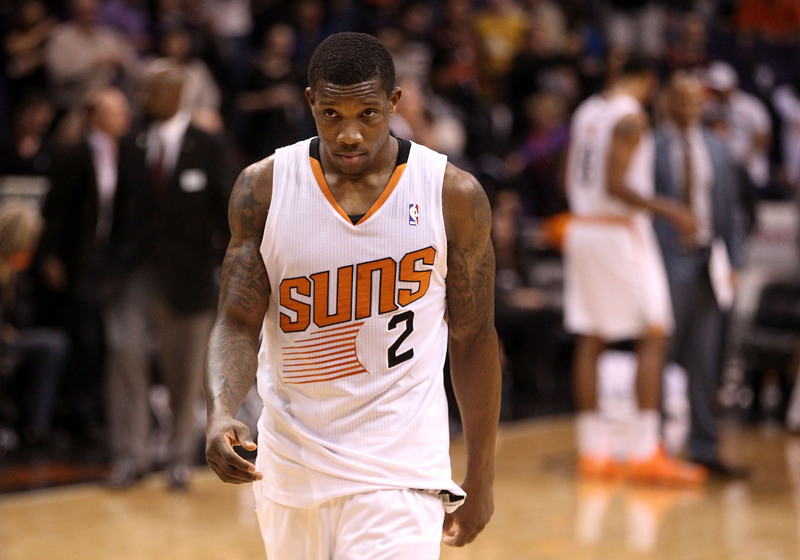 At the same time, Bledsoe’s got the talent to make them competitive in the bombed-out East as early as this season. And as the salary cap rises over the next few years, his max deal in 2014 (four years, about $64 million) should look a lot more reasonable. If you think Jabari and Giannis and Sanders can be stars, there’s no reason not to go after one more star to put the nucleus over the top. We’ll come back to the why, though. Let’s get practical. There are a couple of different approaches here. Assuming they waive Chris Wright’s unguaranteed deal, the Bucks have about $8 million in cap space. That’s obviously not enough to give Bledsoe a max offer outright, but if they were able to move Ilyasova’s $15.8 million in salary over the next two years,1 they’d be awful close. The same goes for Mayo’s $16 million over the next two years. This isn’t completely out of the question, especially if they can find someone who remembers Illyasova in 2012 and then just didn’t watch basketball in 2013. But that’s probably a long shot. The more realistic way to make this work is going after Bledsoe in a sign-and-trade with the Suns. It would require the Suns to admit that Bledsoe doesn’t fit their long-term plans, and it would require Bledsoe and his agent realizing that he’s not getting the max from Phoenix or almost any other team in the league. As the contract talks drag on to nowhere, both those realities are becoming more and more unavoidable. Enter the Bucks. If Milwaukee decides Bledsoe is worth the max deal gamble, it could offer anyone from Henson (2 years, $5 million left) to Zaza Pachulia (2 years, $10.4 million) to Knight (1 year, $3.5 million) to Ilyasova (3 years, $24 million) to bring Bledsoe in on a max deal. It’s doable, particularly if it wants to get creative clearing salaries (Mayo) to other teams or include a draft pick. And giving up a pick makes sense. No matter what happens to the Bucks this year, Bledsoe’s probably better than anyone they can draft next June. In the new transaction-driven NBA, the idea of giving up draft picks is sacrilegious, especially for teams that aren’t one step away from the NBA Finals. 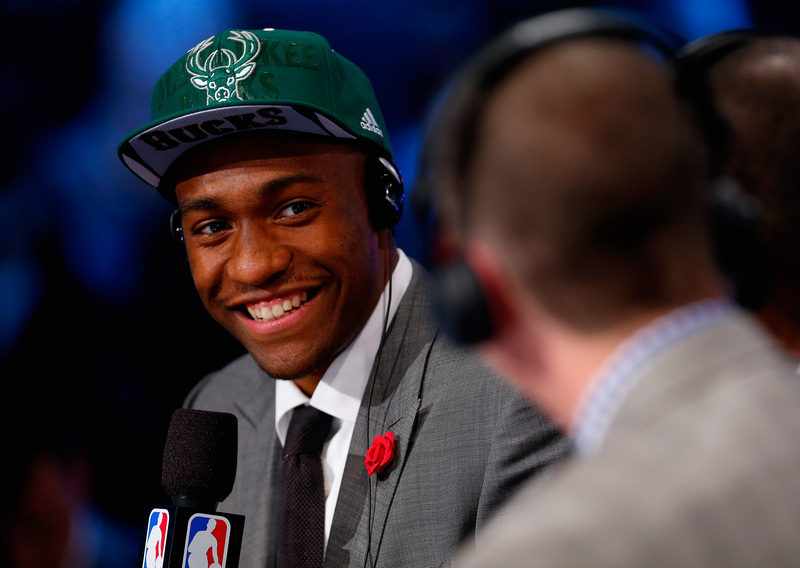 The Bucks aren’t even a playoff team, so, sure, giving away a first-round pick seems insane. But I come to you as someone who lived through this with the perpetually crappy Wizards that somehow aren’t totally crappy anymore. I hated Ernie Grunfeld paying $85 million to John Wall last summer when the Wizards could’ve waited a year; then they traded a first-round pick for Marcin Gortat, once again mortgaging the future for a present that looked awfully mediocre. And then … it totally worked. It was still a huge risk, and it could have fallen apart if a few things had broken the wrong way, but the gamble paid off. The playoff run last year made people care about the Wizards more than they had in almost a decade. Now we’re a month away from the regular season, and for the first time since I was in high school, other NBA players want to play for the Wizards, and I’ve got friends coming up to me talking about how excited they are for the Wizards. It’s like living in an alternate universe. It all started with the Wall max contract, and then the first-round pick in the Gortat trade. Basically, exactly what the Bucks would have to give up for Bledsoe. Winning now serves the long-term goals better than another year in the lottery would. … This team has been rebuilding around young players for years, putting them in hopeless situations, and then turning around a few years later wondering why they never turned into stars. This is a mistake that’s common with lots of bad teams, but the Wiz have perfected the formula. This team’s won more than 40 games once in the last 10 seasons. The owners are currently lobbying for a new arena in Milwaukee, with a provision in their lease that requires the team to break ground in almost exactly three years. The Bucks were saved from relocation last spring, but nothing’s actually set in stone yet. In a more literal sense than last year’s Wizards, winning now serves the long-term goals much better than another year in the lottery. If you want to get a city to love the NBA enough to pay for an arena, winning with a great young team is the easiest way to get people on the bandwagon. Can you imagine how much fun it would be to watch fast breaks with Jabari and Giannis and Bledsoe every night? Bledsoe’s just another star in a Western Conference with 10 playoff teams every year, but how good could he and the Bucks be in the Great Depression–era East? Just … Dream with me. And then forward this idea to John Hammond over and over again until it really happens. Ilyasova is guaranteed only $400,000 for the 2016-17 season.